Best mattress will be ordering another one soon! Boasting robust and flexible wrapped coils that react individually to every contour of your body, firm, supportive foam gently cradles the body, for enhanced pressure-relieving comfort, while cool gel foam provides enhanced, breathable comfort. With sturdy support, this mattress has a special coil-gauge design, for an evenly firm feel throughout. I am not so impressed with this mattress. I was concerned about purchasing a "bed in a box" and especially one I'd never tried before, but I bit the bullet and went for it. I also bought the 10 inch Lucids, 2 of them...I went with this Serta because I wanted my bed to be higher and have a thicker mattress. I think this one is 13 inches. Also, I thought the plush pillow top would be more comfortable. The mattress has not held up well. In less than a year of use, and I do not even sleep on it every night as I travel a lot and my back hurts so sometimes I sleep in other random rooms just to give my back something different but in less than a year, there are lumps in the pillow top. Also, the part of the pillow top where I do sleep the most has started leaning. Additionally, the threads in the pillow top have started coming unraveled. I checked and there is no warranty so I just have to wait it out and I guess replace it once It becomes too bad off. I have friends that have this same mattress but bought it from Sams and theirs has done the same thing. I do not recommend. I had wanted to renew my mattress for many years - it was a Tempurpedic mattress which I had never really liked. I looked online and in stores for so long it became very confusing as to which mattress to choose. Finally I decided to look online as it seemed that things were much better value. The order and delivery process was very easy. The delivery people arrived on time and were very pleasant and efficient. The bed was very quickly set up and my old mattress was taken away. I have had the mattress for a couple of weeks now and I am so pleased with it. The pillow top gives a soft feel to the mattress but it still gives a lot of support. It is high quality and I couldn't be more pleased. It works well with my new adjustable bed as well. This mattress is everything I was looking for. It is soft yet sturdy. I love that it sits high. It was delivered in a very reasonable amount of time. But beware it's not a true queen size. It fell off the rails on one side. The measurements are 59.5" wide by 79.5" long. A true queen is 60" wide by 80 inches long. This mattress didn't work on a queen size bed. Very disappointing. This is a great bed...it is soft and fluffy. I did not know the top is more like memory foam not what I was expecting. Still a great bed but it does contort to your body so if you are looking for a traditional pillow top this is not for you. The bed also is sold as a set...turns out I only needed the mattress for my new bed frame. It also ask box spring size...I had no clue what to pick... so it can be pretty tall for a box spring. Check your sizes... I do love it. Fluffy top durable condition and so far so good. First, the white glove delivery was excellent! They kept us informed about when they were coming, came in the time they said and were very courteous. When I was putting the bed skirt on the box spring one of the guys even helped me. Now for the actual mattress. I'm very happy. It's definitely firm but not too firm. We do need to adjust since the mattress we had was extremely plush. It's nice not to slide to the middle when we're both using it. The quality seems very good and I'm sure it will last for a long time. I've had my new bed for a month now and I couldn't be happier. It sleeps great. I can't say it has cured my back issues, but I do sleep longer at night than I was sleeping, so that's a huge plus for me. It's a little higher than I thought it would be, but my 5'3" self does manage to get it in. My dog, well she has issues. I love the fact that it was delivered right to me and that they even set it up for me. Great service from Overstock! Received mattress and box spring set today and very pleased with the quality and comfort level compared to those found in retail stores at higher prices. 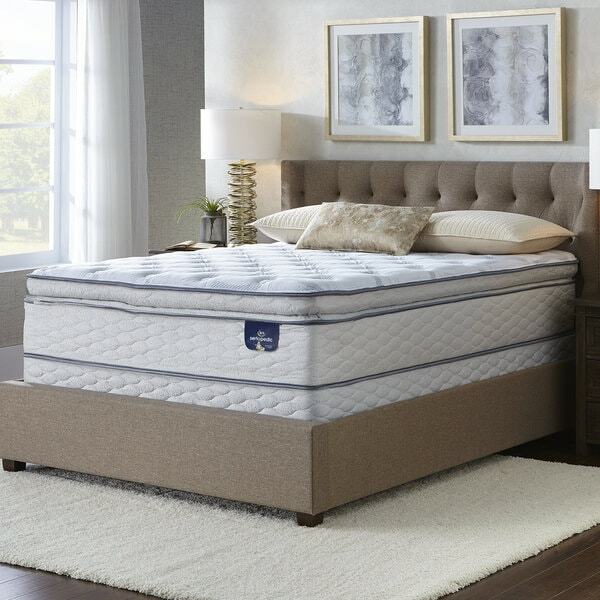 Have the additional peace of mind buying a Serta warrantied mattress. The mattress is definitely firm which I expected but the topper makes it very comfortable. After making the bed I tried it out and fell asleep for a nap. The delivery service was outstanding, sending me voicemails and texts from notification to delivery. My driver even called that they were running ahead and advised me of an earlier delivery timeframe. Deliverymen were courteous, quick and efficient with removing my old bedding and placing my new bedding. 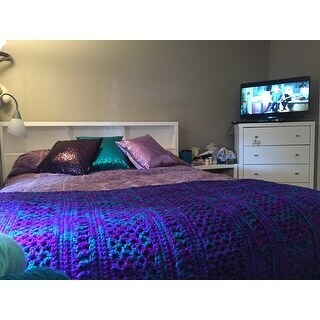 My first Overstock purchase went flawlessly and I was able to obtain a new bed set at a great price. 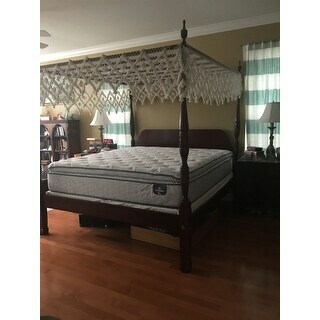 Photo shows the 13" mattress with the low profile box springs, my plantation bed sits high which is typical of that style. Good value - Comfortable mattress! Good value mattress. Doesn’t require flipping. Super thick pillow-top. Easily works with standard king sheet sets. Very soft - would highly recommend even though I wish it was more firm. Very heavy, so thankful for Overstock’s «&nbsp;white glove&nbsp;«&nbsp; style delivery to my 3rd floor. I chose split King low profile box springs, which works well with the bed frame I chose (also from overstock) so we don’t need a step to get up into bed. The mattress is 18.5 inches high so pairing the low profile box springs with it is a nice option! Serta Westview Pillow Top is a really nice, well made mattress; however, I would not recommend buying this online. I read all the reviews and information I could fine on it and felt confident that it was a bargain at any price.... A couple ask if they were too heavy for it and they were told it was suitable for a combined weight of 500 lbs. My husband &amp; I, together weigh 435 so I was confident. BAD DECISION!! My husband at 230 lbs. sinks into it about 10 to 12 inches. He can't move after he lays down. He can't turn over. He's trapped. He's back sleeping on the old mattress in the extra bedroom and I sleep on the new one in the master bedroom. We hate being apart so he spends most of his night sleeping in a chair in our bedroom so he can be near me. Finally during the night he moves to the spare bedroom when his back and bottom hurt enough to awaken him. Lesson learned: Don't buy mattresses on line. Pay the higher prices and shop in person. Great bed, nice pillow top, unfortunately, if you are looking for a bed, and have pressure point issues when sleeping, I wouldn't suggest this bed because even the plush mattress won't be soft enough. Great quality, great customer service experience with Overstock, but a hefty restocking fee! Price and quality is unbelievable!Also the mattress sleeps great though it sits high off the floor, I have been sleeping like a lamb, Thanks Overstocked.com great purchase!To answer Kathy C question,it was delivered to my door in a timely manner,also I put it up myself cause I hadn't removed the old box spring and mattress. This is the most comfortable mattress I have ever bought. It's a pleasure yo go to bed. This mattress is for my son room replacement for a broken Sleep Number mattress . He is very pleased and not really missing the very expensive old mattress. Oh my gosh!!!! This is the best sleep we have had in 15 years! Not even joking. This bed is like a cross between a cotton ball and a cloud. For the money you will not find a more comfortable sleep! I can't believe I got such an amazing bed online! It is very firm, but the pillow top is very plush. Great quality! FYI - the mattress is very tall and deep pocket sheets are still a tight fit. This mattress is very comfortable. The pillow top is plush but the mattress isn't too soft. For me it's the perfect combination of soft and firm. All of the materials are good quality. I was looking for a mattress set that provided a firm mattress with a slight bit of softness and this set delivers! I have been sleeping on this mattress for a few months now and have been having a great nights sleep. I ordered with the low profile, which is exactly the height I was looking for. The regular profile would have been too high for me so I’d highly recommend paying attention to the dimensions to ensure the height is where you’d like it to be. Highly recommend! The mattresses are really comfortable. Unlike other pillow tops they don’t sink in the middle. If you need to relax in the daytime I prop my pillows up and it feels like I’m sitting in a cushioned chair. Nice quality great price. "Do the King mattress set include mattress & box springs?" Yes this includes the Mattress and the foundation. "How tall is the plush foundation purchased with this item? Is it a standard 9 in.?" Dimensions: Mattress: 13.5 inches high x 60 inches wide x 79.5 inches long. Foundation/box-spring: 6 (low-profile) or 9 (regular) inches high x 60 inches wide x 79.5 inches long. Overall set: 22.5 inches high x 60 inches wide x 79.5 inches long. Yes, it is a very firm and plush mattress. With box-spring, it sits high off the floor. "What is the difference between cushion firm and ultra plush? Also can removal of old mattress be arranged?" Ultra Plush is very soft. Cushion firm is a medium firm. Not too firm, Not to soft. I hope it helps. "I have a regular metal frame Mattress, bed holder. Will this support these mattresses?" "Can this mattress hold 400 pounds?" "Being hot-blooded, this type of mattress normally makes me feel unforgettably warm. Many comment about the “cooling action” that indicate they keep your body at a cool state. I don’t see any such indication on your info. Am I missing it or do you have a similar statement?" I feel that the mattress makes me a little warm also. However, it is so comfortable it is really not a bother. "I am hesitant to order online. I'm wondering if people return their mattresses to Overstock causing another buying customer to receive a "returned mattress". I'm very cautious of getting bed bugs and wondering if Overstock even allows people to return mattresses. Thanks!" Our Mattresses and mattress sets are non-returnable upon signature at delivery. I hope it helps. You say your mattresses are non returnable, but in the desscription it states that they are fully refundable if not satisfied..which is it?